Yellow Bird has a button. It does . . . nothing! It is a good for nothing button. Red Bird and Blue Bird are excited to try the button. But when they press it, they discover that the button makes them happy. Happy is something! 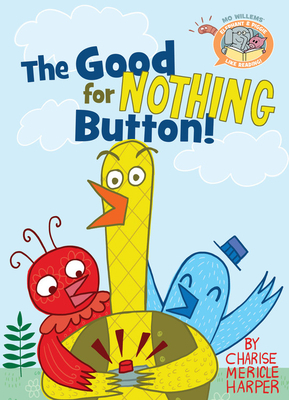 A flabbergasted Yellow Bird insists the button does nothing. But it sure does seem to be making him mad. Mad is something! The hilarious debate that follows takes readers on an emotional roller coaster that pokes at the power of imaginative play. Charise Mericle Harper (www.chariseharper.com) has created many books for children, including Cupcake, Go! Go! Stop!, Princess Patty Meets Her Match, and the Just Grace and Fashion Kitty series. Charise lives with her family in Portland, Oregon. Mo Willems, a New York Times #1 best-selling author and illustrator, has been awarded a Caldecott Honor on three occasions, for Don't Let the Pigeon Drive the Bus!, Knuffle Bunny: A Cautionary Tale, and Knuffle Bunny Too: A Case of Mistaken Identity. His celebrated Elephant & Piggie series has won two Theodor Seuss Geisel Medals and five Geisel Honors. Other favorites include Leonardo, the Terrible Monster and The Story of Diva and Flea. Mo began his career as a writer and animator on Sesame Street, where he garnered six Emmy Awards. He lives with his family in Massachusetts. Series: Elephant & Piggie Like Reading!